4 Strong Paws Chicken & Salmon Puppy Dog Food provides balanced nutrition to ensure the extra nutritional demands of your puppy are met. We use highly digestible meat and fish proteins, the inclusion of prebiotics, probiotics, botanicals and other healthy nutritional supplements to support your puppy’s developing digestive and immune system for optimal health. Main Ingredients: Chicken Meal, Rice, Potato, Chicken Fat (naturally preserved), Brewer’s Yeast, Alfalfa Meal, Salmon Meal, Sweet Potato, Dried Whole Egg, Potassium Chloride, Flaxseed, Sodium Chloride, Salmon Oil, Mannan Oligosaccharides (MOS), Calcium Propionate, Kelp Meal, Choline Chloride, Chicory Root Extract, Yucca Schidigera Extract, Pumpkin, Probiotics (Lactobacillus Acidophilus), Chondroitin Sulphate, Glucosamine, Apples, Carrots, Cranberries, Tomato, Iron Sulphate, Zinc Oxide, Vitamin E, Copper Sulfate, Folic Acid, Vitamin B12, Vitamin A, Niacin, Selenium, Manganese Oxide, Calcium Pantothenate, Riboflavin, Biotin, Vitamin D, Calcium Iodate, Botanicals (Oregano, Cinnamon, Red Pepper Extract), Chelated Minerals (Zinc Amino Acid Complex, Manganese Amino Acid Complex, Copper Amino Acid Complex, Cobalt Glucoheptonate). 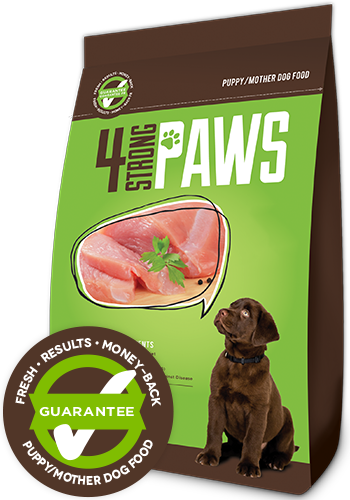 4 Strong Paws Chicken & Salmon Puppy/Mother food is formulated to meet and exceed the nutritional levels established by the AAFCO Dog Food Nutrient Profiles for growth, gestation, and lactation. Please follow these recommended feeding amounts to maintain the ideal body condition for your puppy. These are suggested amounts and will need to be adjusted based on individual dogs’ energy requirements, climate and exercise levels. When feeding more than once a day, equally divide the recommended amount into equal portions per serving. Keep fresh drinking water available at all times, provide daily exercise and maintain regularly scheduled veterinarian visits. We recommend sealing the bag tightly with the 4 Strong Paws clip in order to maintain freshness. Store in a cool, dry location. Dry – Serve our FRESH, tasty dry kibble right from the bag. Dry with Warm Water – Add water to moisten and mix to fully release flavours and aroma. Be sure to have a clean bowl of fresh water available at all times. * Use a standard 8 oz. measuring cup which holds approx. 4.0 oz (120 ml) of 4 Strong Paws Puppy/Mother Dog Food. All discounts will be applied in the cart. *Shipping fees may be applicable in certain zones. You will be contacted if applicable. *DELIVERY IN CERTAIN SHIPPING ZONES OF CANADA MAY TAKE UP TO 7-BUSINESS DAYS AND SURCHARGES MAY APPLY. YOU WILL BE CONTACTED IF THIS IS THE CASE.